Did you know that Shelly Irwin of WGVU does wonderful interviews with cast members, directors and producers of many of our local theatre productions? On Thursday, April 17th she interviewed Craig Hammerlind and Amy McFadden of God of Carnage. You can take a listen on the WGVU website! Monday morning Shelly Irwin interviewed Director Fred Sebulske and Cast Members Amy Osborn and Jean Reed Bahle of August: Osage County on her Morning Show on WGVU Radio. If you missed it, you can listen to it on www.wgvu.org. Also in the media, Katie Greene of MLive.com got some great photos of the cast on Dress Rehearsal. Click the photo below to see more! 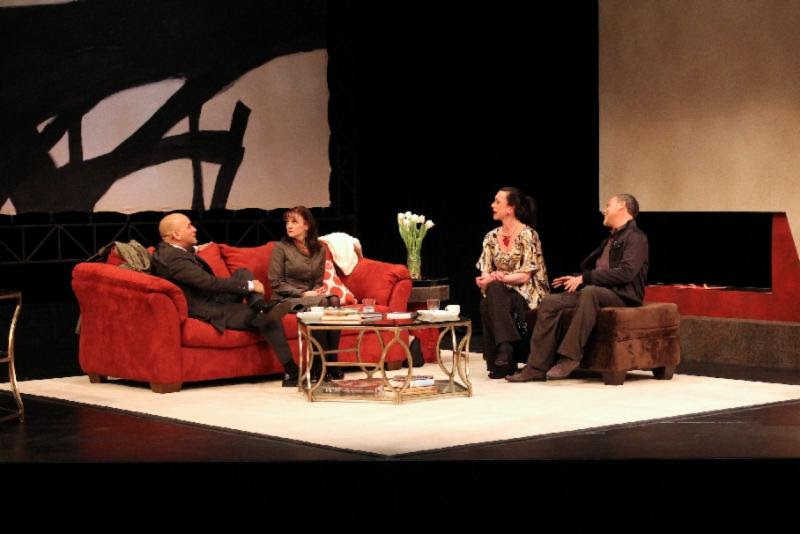 Go to www.atgr.org to learn more about Actors’ final production in our 31st Season. Box office and ticketing information are also available on the site. As a reminder: August: Osage County closes this weekend, so call ahead for tickets! GRAND RAPIDS — Luke is a devout believer who thinks his homosexuality is a sin; Adam is an atheist who believes in everything but God. Despite their different world views, they have made their relationship work for five years when a car accident changes everything. This is the setup for “Next Fall,” a play to be staged for the first time in West Michigan by Actors’ Theatre, starting Thursday. Director Tom Kaechele was riveted when he saw it off-Broadway in 2009. Check out the rest of the article, here on www.mlive.com or go to Actors’ Theatre website to learn more and purchase tickets. Remember – Next Fall opens this Thursday. Get your tickets today! Check it out: Austin Bunn interviewed in www.wakegreatlakes.org about RUST. Look for Austin and company to take performances of RUST on the road in the near future, in addition to Iowa performances by our friends at Working Group Theatre. Rust is a play by Austin Bunn that chronicles the fallout after the closure of the GM plant in Wyoming, Michigan — just one event in the gradual loss of manufacturing jobs in the region. The play, developed with a “Creation Fund” grant from the National Performance Network, recently concluded its run at the Actors’ Theatre of Grand Rapids, Michigan. Plans for a fall 2012 tour of other sites in Michigan are already underway. Wake interviewed Austin Bunn shortly after the Grand Rapids run. Wake: Rust is a documentary play. What does that mean, and why or how did it take that shape? Have you heard the great buzz about The Sweetest Swing in Baseball? Want to learn more about the play and the creative process that goes into taking it from the rehearsal room to the stage? Be sure and check out this interview with Sweetest Swing‘s director, Shelly Urbane.